Box Office Hours of Operation: 11am to 5pm, Monday through Friday 11am to intermission on show days and two hours prior to a scheduled performance through intermission on Saturdays & Sundays. Ticket Policy: ALL TICKET SALES ARE FINAL. NO REFUNDS. NO EXCHANGES. Lost Tickets: If you are unable to locate your tickets, please contact the box office to reprint them. Please note a reprint voids all previous tickets. Reprint fees may apply. 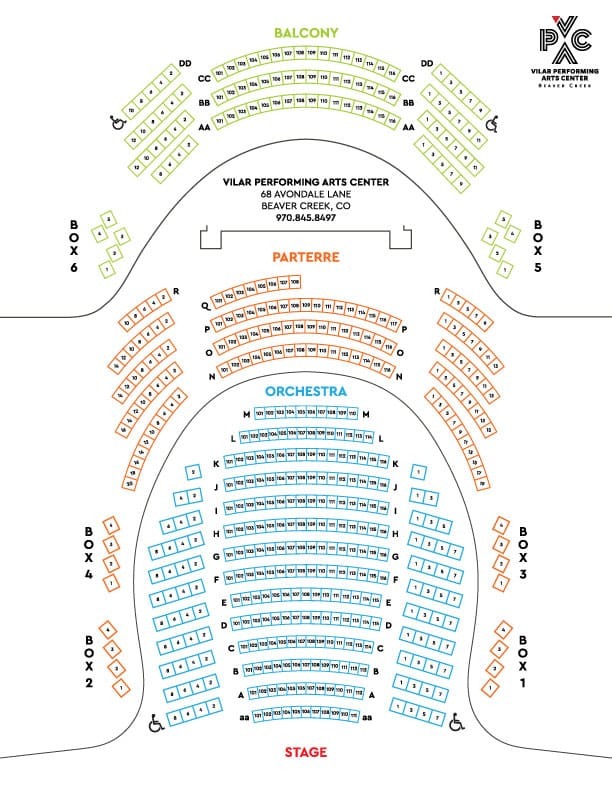 Third Party Tickets: Vilarpac.org, vaildance.org, vvf.org and ticketsvail.com are the only official online ticketing providers for all performances at the Vilar Performing Arts Center. Tickets purchased from other sources may be more expensive, invalid and/or ineligible for box office assistance. The VPAC and the Vail Valley Foundation are not responsible for tickets purchased from other sources. ADA Accessible Tickets: The VPAC is fully ADA accessible. ADA Accessible seats are available in each section (Orchestra, Parterre & Balcony). Please contact the box office for additional information or to make a special request. Child & Student Tickets: Some performances offer a child rate for children age 12 & under. Children under 2 years of age do not need a ticket. They are required to sit on the lap of the adult and to not interfere with someone else’s seat. Student rate tickets are available to some performances for anyone age 18 & under with a valid student ID. Seat Map: Please note that seats on the left-hand side of the theater are odd numbers (i.e. seats 1 and 3 are adjacent to one another) and seats on the right-hand side of the theater are even numbers (i.e. seats 2 and 4 are adjacent to one another). VPAC Bag and Prohibited Items Policy: All bags and persons entering the venue are subject to search. VPAC management reserves the right to refuse entrance to any item deemed a potential safety or security risk or with the potential to be a distraction to the event being held. Late Seating: We recommend arriving at least 30 minutes before any performance start time. In order to minimize disturbances to other audience members, latecomers will be seated at the discretion of VPAC management.